^ Dumas, Alexandre. The Three Musketeers, chapter 9. ^ Dumas, Alexandre. The Three Musketeers, Author's Preface. ^ 金庸自曝：喜欢大仲马 鹿鼎记仿三个火枪手. 环球时报. 2012-11-26. （原始内容存档于2014年3月5日）. Cooper, Barbara T., "Alexandre Dumas, père", in Dictionary of Literary Biography, Vol. 119: Nineteenth-Century French Fiction Writers: Romanticism and Realism, 1800–1860, edited by Catharine Savage Brosman, Gale Research, 1992, pp. 98–119. Hemmings, F. W. J., "Alexandre Dumas Père", in European Writers: The Romantic Century, Vol. 6, edited by Jacques Barzun and George Stade, Charles Scribner's Sons, 1985, pp. 719–43. Foote-Greenwell, Victoria, "The Life and Resurrection of Alexandre Dumas", in Smithsonian, July 1996, p. 110. 古腾堡计划中收录的《The Three Musketeers》免费电子版本. Plain text format. 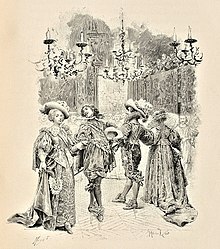 The Three Musketeers, online at Ye Olde Library. HTML format. The Three Musketeers, full text and audio. The Three Musketeers. Scanned public domain editions in PDF format from Google Books, some w/ illustrations, introductions and other helpful material. The Three Musketeers. Scanned public domain editions in PDF format from Archive.org, some w/ illustrations, introductions and other helpful material. 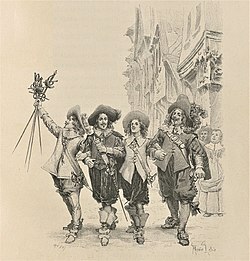 "The Paris Of The Three Musketeers", by E. H. Blashfield and E. W. Blashfield. Scribner's Magazine, August 1890. Cornell University Library. 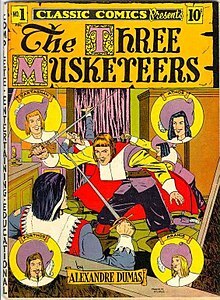 History of Dumas' Musketeers, shows links between the characters and actual history.